Are your forklift drivers certified or have their licenses expired? Liftway offers driver training courses for the following applications – Electric and Internal Combustion Lift Trucks, Scissor and Manlifts, Zoom Booms and Personnel Carriers. Let our Certified Forklift Instructor train your employees to be licensed to operate your lift trucks in a safe and productive manner. Don’t risk operating with untrained forklift drivers and face severe fines and penalties. Our Forklift Driver Training Program will provide your forklift drivers with the knowledge and skills to competently and confidently operate your forklift trucks. If you have multiple people requiring training we can arrange training at your location. Next Course Date: May 7th @ 9 am. Future scheduled dates are June 4th and July 9th. Next Course Date: May 21st – 9 am. Future scheduled dates are June 18th and July 23rd. Location : Comfort Inn, 1100 Richmond St., Chatham (theory & written). Practical training across the street at Liftway shop. Courses can be performed at your location or at our premises on a scheduled basis. Re-certification refresher training courses are offered at a lower cost that the fee for inexperienced drivers. 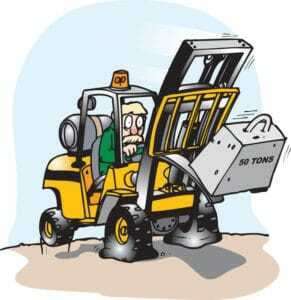 All forklift driver licences must be re-certified every 3 years. Please call Lily for a quote to re-train your drivers to ensure your forklift drivers’ licenses don’t expire. Update your forklift driver’s licenses before it expires. You may not be aware that the CSA recommends: 6.21.1 Retraining – Operators of forklifts shall receive retraining at intervals not exceeding three years. Retraining shall meet the requirements of Clause 6 (Operator Training). Liftway Limited also offers a train the trainer course. For more information click on the course outline page below. Make sure your forklift drivers have current valid licenses. Visit the link below to watch a short video regarding driver training information. OSHA estimates that tens of thousands of employees are injured or killed annually due to forklift accidents. OSHA requires all employees to be trained before driving a forklift. Training should include classroom sessions, hands on driving and a driving evaluation.